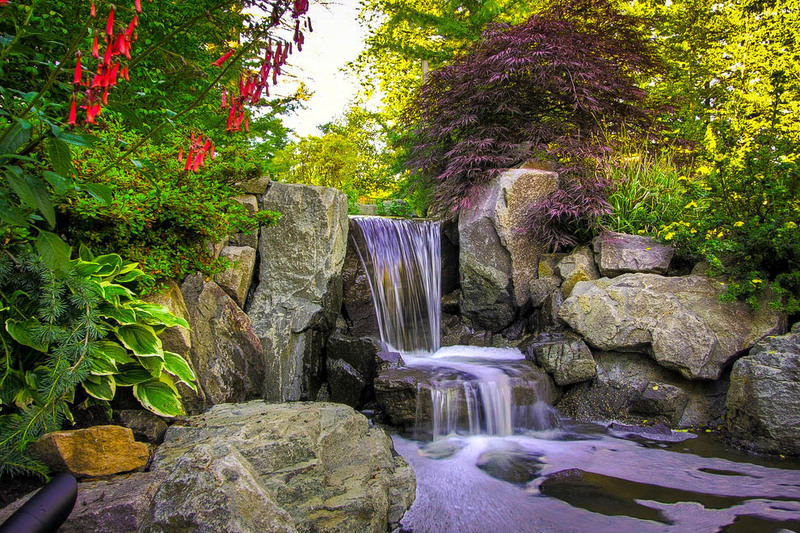 Japanese and Asian-themed gardens are amazingly popular – and no wonder. They combine beauty with serenity, and by using just a few carefully chosen plants they create low-maintenance gardens, turning a few plants and rocks into a place of beauty. They are also perfect for smaller spaces, and courtyards, which are becoming increasingly common, especially in urban areas. You can even create an Asian ambience on a terrace or patio, with some beautiful pots and some stone decorations, like a lantern or a seating Buddha. Although there may not be many used, plants are still an integral part of an Asian garden, so choosing them should be just as important as choosing decorations or raking gravel. The best way to select plants that look best, and have the right ‘feel’, is to use plants popular in Japan. Using authentic plants in turn creates a more authentic feel to your Asian space, and immediately transports you to the Japanese garden of your dreams. With all that in mind, here are seven plants that are authentic, grow wild in Asia, and give your Asian-themed garden just the right look. Remember that even in a garden, Japanese gardeners love to grow plants in containers, as bonsai, or just to be able to move them around and enjoy them. They also like flowers, so think beyond pine and maple – although you can hardly have a Japanese garden without those two basic plants. Nothing says ‘Japanese Garden’ more than a graceful maple tree, in the purity of its first spring leaves, or perhaps when the last few red ones hang on in fall. In Western gardens top favorites are often red-leaved, and cascading, but the Japanese prefer more natural looking, upright trees – so follow their lead and choose something with green leaves, in an upright tree form. If you have a larger space there will be room for a broad, weeping red-leaf form too, but start with something simpler. Good choices include the Coral Bark Maple, with simple but elegant leaves, an upright form, and red twigs in winter. Another upright tree with real character is called ‘Shishigashira’, or the Lions Head Maple. It has a much denser structure than many, and a rugged character. Japanese people also love the Full Moon Maple (Acer shirasawanum) so choose a variety like ‘Autumn Moon’ or ‘Aconitifolium’, both with broader leaves, like an outspread hand, and stunning fall colors. A pine tree is the essence of the Japanese garden, so choose an authentic species, like Japanese Black Pine (Pinus thunbergii), or Japanese White Pine (Pinus parviflora). These trees, especially Black Pine, appear in every garden, and they are often carefully trained and trimmed to create a kind of full-sized bonsai called niwaki. This is not so hard as it looks. The branches are tied to poles until they take on the form you want naturally. Each spring the new growth is pinched back, to develop dense, flat layers of needles. You too can do this, and grow a pine that will give an authentic look to your Asian garden. These pines are also popular bonsai subjects. The Japanese grow azalea bushes as much for their foliage as their flowers. They clip them as we might boxwood, and you can do the same, although you will probably not want to trim off the flowers, as the Japanese are known to sometimes do! Since you almost certainly want flowers, why not be discretely not authentic, and grow Encore Azaleas, which give a second flowering in fall? They have the same dense, small-leaved form the Japanese love, and if you clip them annually immediately after the spring flowering, you can enjoy flowers, plus keep them rounded in the Japanese fashion. The glossy evergreen leaves of camellia bushes fit perfectly into a Japanese garden – and the Japanese think so too. They are grown in shadier corners, or beside a gateway, and trimmed just a little for neatness. For a different, and completely authentic feel, why not grow a fall-blooming one, like the hybrid Camellia × hiemalis. It has a gorgeous deep-pink variety in the cup-like shape loved by the Japanese, showing a central ‘shaving brush’ of yellow stamens. Called ‘Kanjiro’, this variety was bred in Japan in the 1950s, and will really bring you that authentic look. Rather than grow it as a climbing vine, Japanese and Chinese gardeners often train their wisteria into twisted trees, with broad spreading branches. You many not choose to go this far – it takes patience, a wooden framework and regular pruning – but even if you simply grow it on a fence, wisteria is so beautiful in spring that you cannot be without it. Cheat a little in our colder climate and grow the hardier American species, Wisteria frutescens, in the variety called ‘Blue Moon’. It flowers even in zone 3, and it has hanging clusters of sky-blue flowers a full 12 inches long. Make some green tea and contemplate true beauty. Bamboo is often too large for small gardens, so choose instead the Sacred Bamboo, Nandina domestica, another native Japanese plant widely seen in their gardens. This attractive plant has finely divided leaves, looking somewhere between a fern and a true bamboo. It grows best in warmer zones, but it will grow even in parts of zone 5. It may look delicate, but this tough plant thrives in shade, and goes through many changes in foliage color over the year. The original plant can grow 6 feet tall or more, and looks wonderful in a shady corner, but for a smaller spot, or underneath those pines and maple trees, choose one of the modern dwarf forms, which have even better foliage colors of red or yellow, like ‘Moon Bay’, ‘Gulf Stream’ or ‘Firepower’. Beneath the taller plants will mostly be gravel or moss in a Japanese garden. These open spaces are a large part of what creates their unique ambiance. But always there will be small plants filling a corner, or planted at the foot of a boulder, just as we see plants growing in nature. A popular plant in Japanese for tucking into shady corners, beside a step or doorway perhaps, is Lily Turf, Liriope muscari. This grass-like plant grows in both sun and shade, and a popular form is called ‘Royal Purple’. It has purple to black foliage, and spikes of deep-blue flowers that come in fall. The color combination of falling red and gold leaves against those rich purple-blue tones is absolutely stunning – and it has a true ‘fall in Japan’ feel to it.